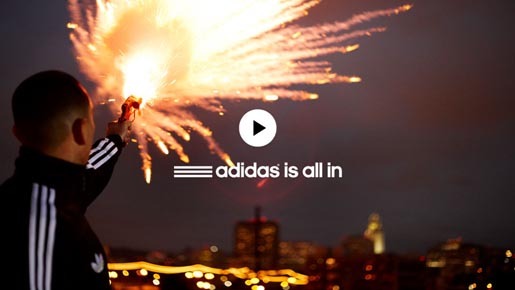 adidas has launched “All In”, a large integrated advertising campaign featuring Sport Performance, adidas Originals and adidas Sport Style sub-brands together. The campaign is centred around a video featuring Justice track “Civilization” and adidas sports and culture personalities, including Katy Perry, Derrick Rose, David Beckham and Lionel Messi, B.o.B. and skateboarders Silas Baxter-Neal, Lem Villemin and Jake Donnelly. The adidas YouTube channel includes different TV and online versions of the film and drives viewers to the Adidas Facebook page, where viewers can submit their own “game face” photo for a chance to appear in an Adidas spot to air during the MTV Movie Awards. Short films by filmmaker Romain Gavras document Katy Perry, B.O.B., Lionel Messi, David Beckman, Derrick Rose, Dennis Busenitz, Louis Smith and The Like during their daily life. Adidas ran a number of short teasers in the week leading up to the launch of the All In campaign on March 16. Derrick Rose is all in. Feel the passion with the American Basketball star and get all in with adidas in 2011. He was born in Georgia, raised in Decatur, but the stage has always been where he’s most at home. 500 fans packed into a warehouse in London’s East End get a performance they won’t forget: B.O.B. goes all in. In 2008 Louis became the first British gymnast to win an Olympic medal in 100 years. If he is going to turn bronze into gold at London 2012 he is going to have to go all in. The Adidas All In campaign was developed at Sid Lee, Montreal, working with Adidas Canada president Steve Ralph and Adidas USA president Patrick Nilsson. Filming was shot by director Romain Gavras via Soixante Quinze nd director of photography Andre Chemetoff.